The drawers are made of paracetamol packets, with the front cut off, turned over and re-glued to the base (which also restores the other end of the packet, which comes away with the front when you cut it off). The frame for the drawers is made of double-layers of cereal packet and then the whole of the outside is strengthened with a layer of thicker (also recycled) card. Papers are Bo Bunny Snowfall. The drawer knobs are brads, which have been pushed through a very small length of plastic tubing (also recycled) to allow them to stand away from the drawers. 'Joy to the World' was die-cut from a brochure cover that just happened to be the right colour: some of the snowflakes were actually cut from virgin card - mixture of textured, pearl and glitter card. Not all the drawers fit as well as I'd like, but generally I'm pretty pleased with it. Lovely, really wintery colours. What are you going to put in the drawers, choccy each? Ooh, oh, my, Wowser! This is gorgeous! Just gorgeous. You've done a great job, Lynda. What a great idea Lynda, love those colours. 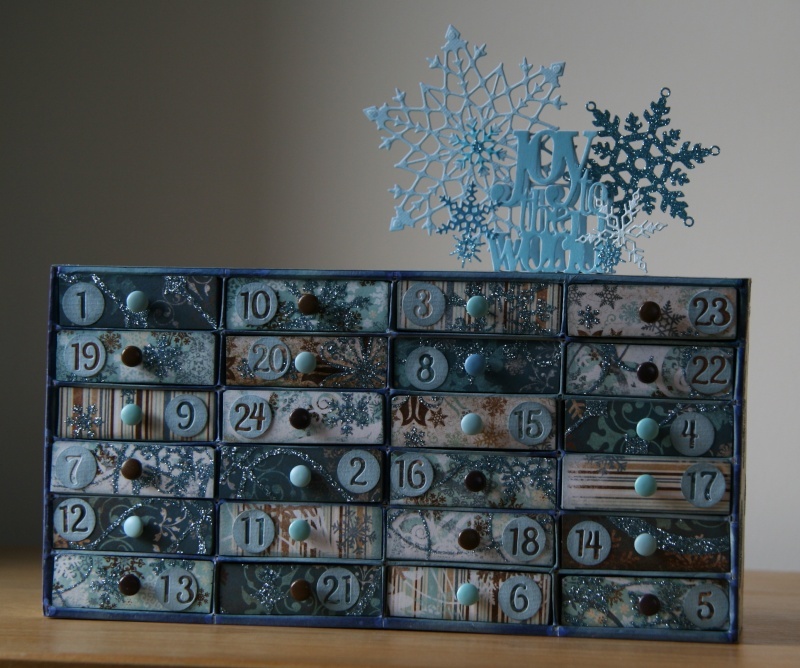 What a great advent box love the colours. Wow Lynda this is Fabby. Love the colours/papers you have used. finished off a treat. I did see this while staying with Lynda and Steve, it just wasn't fully finished then. Thanks, girls: the papers are the same ones I used for the handmade gift in Lorraine's SS a couple of years back. Yes, Di - a choccie or two, as the drawers are too small for a choccie of much size. We did actually use it last Advent, from about the fifth day when I'd finished the actual chest of drawers.